GAME NAME: Don’t Die, Mr. Robot! Robots are awesome. Killing robots is less awesome. Especially when all that robot wants to do is eat some delicious fruit. Alas, our robot pal will eventually succumb to evil haters of robot nutrition in Don’t Die, Mr. Robot from Infinite State Games, a frantic arcade-style game made to have its high score set across four different modes. When you collect fruit, the fruit explodes. Any evil robots caught in the wake will also be destroyed. Any fruit caught in the wave will explode to create destructive chains of fruity goodness and score multipliers. 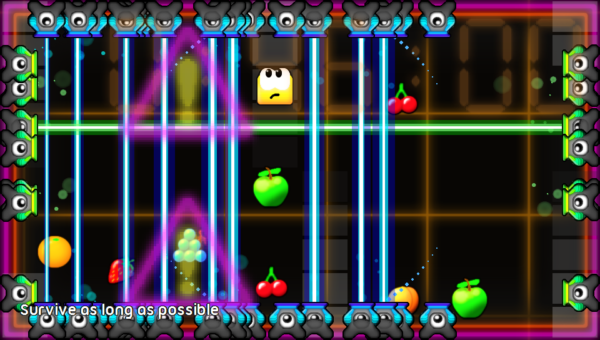 The main chunk of the game takes place in remix mode. Here you have 50 different challenges to complete with various goals and handicaps each level. For instance, one level you may be tasked to collect 25 grapes before dying. The next you may only be allowed to move on a horizontal plane. 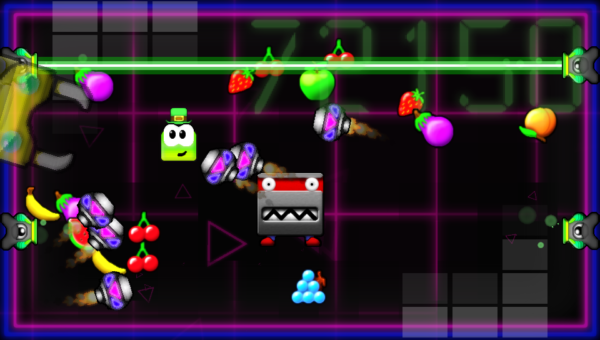 Each level has four different score thresholds to reach, earning the player a bronze, silver, gold, or platinum ranking. Each ranking achieved comes with a point value, which you need to buff up to unlock the next set of challenges. I liked the variety that these remix levels held. Playing in the same type of way in a game like this can get pretty stale after awhile, so I appreciated having to do things with a slight difference every time. Some of the boards are truly challenging, especially when you’re going for the gold or silver ranking. Hell, even a good chunk of the silver ones are tricky, so a faster level restart would have been appreciated. Thankfully the controls are very responsive. You can use either of the analog sticks or the directional pad to move, and any of the options feel great. If you’re going for a high danger bonus (given by turning into a creeper robot and grinding against the bad boy robots), using the d-pad is a must to maintain your lines. But in regular play, the analog sticks work great. None of the face or shoulder buttons do anything besides navigate menus, so a complex control scheme is not something to worry about here. If pushing little plastic nubs isn’t your thing, you can also use tilt or the rear touchscreen to move your little robot dude, but I found neither to be as responsive or precise as the analog sticks. In fact, the rear touch option is borderline broken. The other modes to play include an Arcade mode, Time Attack, and Chill Out mode. Arcade is your basic goes-forever, different-every-time stage to get mega-high scores. 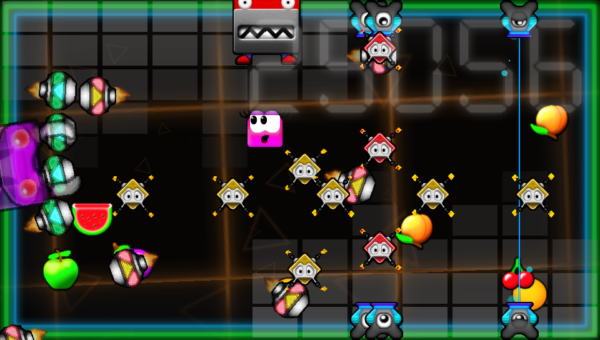 Time Attack gives you two and a half minutes to survive in a more frantic environment. If you die, you lose precious time and points, so don’t do it. Lastly is Chill Out mode, which slows things down just a bit, but still gets pretty crazy once you get into it for a piece. All of these modes are fun in their own way, and are great for when you only have a couple minutes of game time available. Each also contains their own leaderboard so you can compete with your friends and the world. You can also use any of these modes to collect coins that appear when you defeat enemies. These coins can be used to purchase new characters or different hats and outfits for your robot. Press material boosts over 5,000 different combinations available, so if you gotta dress em’ all, you better start clearing your calendar. Visually, the game is nothing exciting. In fact, it almost looks like it could have been released on the last generation of handheld hardware. Colors are kind of drab and nothing really looks very polished, with jaggy edges abound. 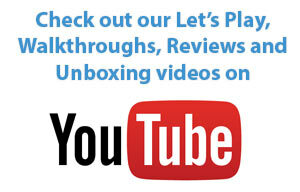 It doesn’t take away from the fun gameplay, but it’s just not impressive at all, and it doesn’t have to be. At least the soundtrack is decent. Don’t Die, Mr. Robot is a pretty good little frantic arcade game that’s great at what it sets out to do, which is make you want to give it one more go after you lose. Whether you just want a quick time waster or want to drown in unlockable outfits, you’ll find a good amount to do to keep you busy. It’s obviously not the deepest or most robust title available, but it has fun coming out of its little robot ears.